My husband is not just a talented comedy writer, but he is also a gifted musician. Because music is one of his great loves, our apartment is filled to the brim with records (Actual Vinyl), various musical instruments, and all sorts of technical looking equipment for listening to and making music. One of his most beloved pastimes is fiddling with said equipment to get the sound “just right” a tweak of one knob, a push on one slide, his head tilted to the side listening, listening for that perfect tone. Now, a bit of transition, but we will get back to the music, I promise. Kristen talked about how there are so many conditions that allow a child to be successful or unsuccessful, and like a sound mixer (Aha! there is the connection!) we have to mix the perfect set of conditions for each child. 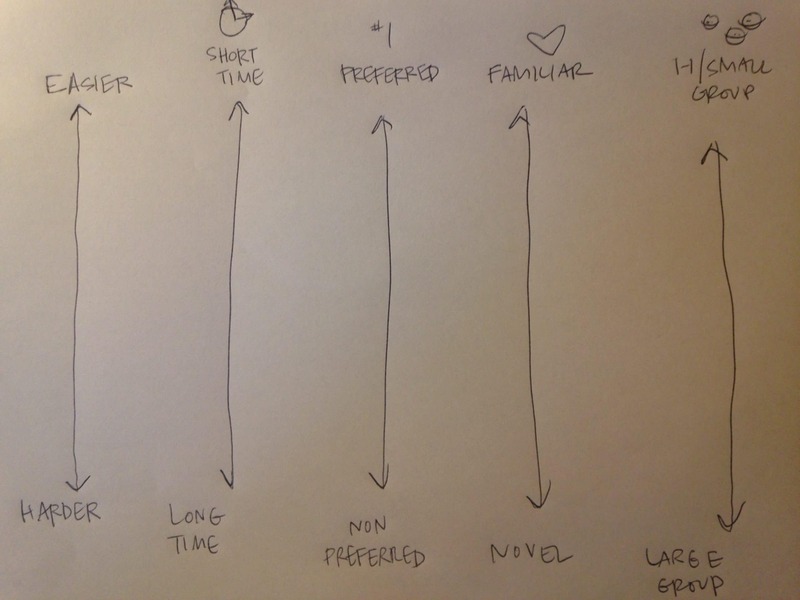 She listed things like preferred v. non-preferred, familiar v. novel, length of time, group size etc. Now some of you out there may have known and manipulated these conditions for years, but for me, this brought something into sharp relief. For Silas, who loves trains and is working on beginning reading behaviors and focus, I may have to move the dial closer to preferred texts to ensure success. Why make him work in non-train books if that means he will be unable to practice the work he is learning? For another child to achieve success, I might have to move the dial closer to “shorter time”. Why keep a child unsuccessful in a 30 minute workshop, if she can be successful in a 10 minute interval? Sometimes we ask children to be successful when we have moved all the dials to “11” (if you get that joke, high five, if not, I just mean we turn everything to its highest/hardest setting) We say “You have to do this for a long time, in a non-preferred seat, with a novel text in the large group” and we wonder why some kids struggle. True individualization resides in me being able to craft the perfect mix for each child and slowly raising the dials in the area the child is working on. Perhaps the key is realizing that our goal is that children realize that a thoughtful strategic process can result in success, that a just right risk has its own reward of growth- not that everyone can do it the same way with the dial on 11. If a child can be successful socially in a familiar situation with preferred friends, why are we surprised when that success erodes in novel situations with non-preferred friends, if we haven’t identified and helped ease that transition? Key takeaway? There is a lot to consider when we design a just right challenge for children, beyond the pure academic or social work. Being aware of all the conditions we can manipulate can make a huge impact in how successful we are in supporting our children. Click on Kristen’s name to learn more about her- she is amazing. Watch spinal tap to get the “11” joke. Love, love, LOVE this! Must read! Thanks so much for your kind words! Am so glad you found it helpful! Mind blown! Thank you so much for sharing this. This came just when I really needed it! Have I told you lately how much I miss you! I love this analogy. Just like the kids I work with, having a visual helps me remember what I’ve learned and teach it others. Often, we change one only one factor and say we’ve individualized…then wonder why kids still aren’t successful. Please keep sharing. I want to learn along side you! Amazing! Thanks for sharing your learning with the world. It’s always about the combinations as changing one thing just starts the movement of the dominoes. Keep turning those dials!! !